The Palestinian Government strongly condemned, on Thursday, a new Israeli military order affecting the so-called Area C, which amounts to more than 60 percent of the total area of the occupied West Bank and which is under full Israeli military and administrative control. “This illegal development would generate more crimes against Palestinian rights of access to a safe and stable living environment and would worsen the already dire conditions of 393,000 Palestinian citizens,” the government said in a statement issued by the Prime Minister’s Office. 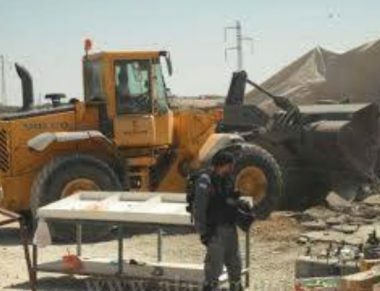 On May 9, the Israeli military published military order 1797 with the main objective of expediting Israel’s unlawful demolitions of Palestinian infrastructure in Area C. The new order further expands the authority of the Israeli army’s so-called “civil administration” to unilaterally target and demolish Palestinian structures within 96 hours, irrespective of the status of the underlying land or the issuing of building permits. In related news, the Palestinian presidency has condemned an Israeli court decision to demolish and uproot the Bedouin community of Khan al-Ahmar in the Jordan Valley, about 15 kilometers to the east of Jerusalem. “This policy of ethnic cleansing is considered to be the worst form of racial discrimination, which has become the predominant feature of the practices and decisions of the Israeli government and its various instruments,” said the presidency in a press statement referring to the Israeli decision. The presidency called upon the United Nations and the signatories to the Geneva Conventions and other international institutions to take urgent action to prevent this ‘racist’ decision and to provide international protection to the Palestinian people. On the international spectrum, Al Ray Palestinian Media Agency reported that 76 members of the US House of Representatives signed a letter, addressed to Israeli Prime Minister Benjamin Netanyahu, demanding to stop the policy of destroying Palestinian homes in the occupied West Bank with the aim of expanding settlements. According to Haaretz, Democratic part members of Congress called for a halt to the demolition of Palestinian houses in Susya village, Hebron. It pointed out that US lawmakers drew conclusions from Netanyahu’s view that, while the village of Susya is becoming piles of rubble, Jewish settlements in its surroundings are flourishing and expanding. The paper quoted a senior official of the liberal-leaning American Jewish organization, J Street, as saying that the move is considered to be, perhaps, the biggest move by Congress against the settlements.